Protect computer training courses, research reports, confidential information, reference guides, price lists, customer contacts, repair manuals, demonstration videos, games and eBooks. Protect your work and increase sales. Create a protected Mac or Windows application from your document with a few button clicks. Control how many computers can use your document, the activation process and license type. 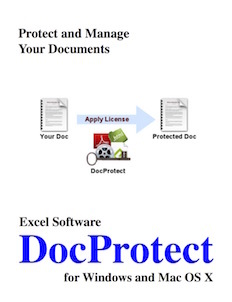 Use DocProtect to generate a protected application from an EPUB file, the industry standard for electronic publishing. Deliver a single file to your customer that includes the EPUB document, reader and licensing software. An HTML project containing hundreds of files and folders can be compiled into a desktop application with a custom icon. Simply drag the main file onto DocProtect. The application can be password protected or a computer specific trial or product license can be applied. A browser window with Back and Forward buttons allows link navigation to embedded pages and external pages on the Internet. Document authors can include HTML pages and data from a hidden area of their web site in the protected Mac or Windows desktop application. Use DocProtect on video and audio files of type .mov, .mp3, .mp4, .avi, .dv, .3gp, .m4v, .flc, .f4v, .alf, .au and .wav. A viewer window based on Apple's QuickTime technology presents the video and audio. It prevents copy or export. Turn a SWF file into a protected desktop application. Select a folder of numbered JPG images and click Build to create a professional Slideshow. The user can click left or right through the sequence of titled images or click to a specific spot in the presentation. Image files can be collected, named, described and individually password protected. Users can preview images, then click a button to present a vendor web page to purchase the image. Purchased images can be exported as the original file format including vector images, drawings or CAD files. For PDF files, first use Adobe Acrobat to restrict features like copy, export or save. Now use DocProtect to wrap a protective license around the document and turn it into a protected executable. Adobe Illustrator (.ai) files can also be protected. Many other file types can be saved as a PDF before applying protection. Learn more about protecting PDFs. Protect Excel, PowerPoint, Publisher and Word documents created with Microsoft Office. DocProtect can also output a protected document that can be viewed within the SafeWebApp viewer. SafeWebApp is a free viewer that can expand the supported platforms and delivery options for protected documents. Build your own Android app (APK) without programming. Select an EPUB, PDF, MP4 or collection of HTML files for the source content. Add a splash and icon image, then enable optional licensing features. Now click a few buttons to output an App that runs on Android phones or tablets. Upload your APK file to your website or an App store for users to download, install and run. Apply a computer specific password and distribute the same protected document by CD or download to all customers. On first open of your document, the user is presented with a dialog requesting a specific password by number. Enter the password number into DocProtect to generate the required password. Link your protected document to an automated password server like Safe Activation. The user enters the Serial Number provided during purchase. The password server controls how many computers can run your software based on the Serial Number. QuickLicense can be used with DocProtect to add more license types, features and language customization. Create Trial, Product, Subscription or Floating licenses. Automate the evaluation, purchase and activation process with a Try, Buy and Register dialog. A vendor can block an activated license before issuing a refund or allow a customer to securely move a license between computers. Create a group license to protect multiple documents with one activation or a subscription service. DocProtect can generate 32-bit or 64-bit apps on macOS or Windows that embed your protected document. During the build process, apply your own Code Sign certificate. This tells the OS, Web Browser and Virus Scanner that it can trust your application. DocProtect Windows runs on Windows 7, 8, 8.1 and 10. DocProtect MacOSX runs on macOS 10.9 or later. DocProtect uses Apple's QuickTime Player, Adobe Reader, Acrobat Reader DC or Flash Player plugins for some protected document types. DocProtect includes a Legacy Build to support older Mac OS X 10.6, 10.7, 10.8 and 10.9 computers.